This quick and easy cultural craft is also useful both inside and outside the classroom! This kid-friendly take on a traditional craft is a beautiful take-home piece, but if they stay in the classroom, they’re great for holding pens, pencils, manipulatives and other small personal items. Learning Outcomes: Explore the tensile strength of paper and it’s similarities to birch bark. Learn about using natural materials to create art that is both beautiful and practical. Exercise fine motor skills by cutting and taping. Birch trees are found all over North America and Eurasia and before the widespread use of pottery and ceramic containers, birch bark and wood were the most flexible materials available. The wood and bark of this tree were used by a variety of cultures. Native American and First Nations birch bark baskets might be one of the better-known uses for birch bark, but native peoples in North America also use birch bark for canoes, wigwams and tinder. Asian countries (including Siberia, Ancient China and Ancient Assyria), Scandinavia and Finland used birch bark to make storage containers, roof coverings and waterproof coverings for bows. In Russia and India, birch bark was used to record manuscripts before the availability of parchment, vellum or paper. Some of the oldest known Buddhist texts were written on Birch Bark. Our paper version of this ancient craft is quick and simple. Start by downloading the Birch Bark Basket template. The template contains two different style of basket. Print out the templates on a sheet of craft paper. It may take some experimenting to see which way you need to put the craft paper into the printer so the lines print on the white side. We used the birch bark design for our basket, but you can choose your favorite paper! These templates would also work well with our R15294 Terrific Tree Craft Paper. Once your basket is ready, you can add embellishments. We used the leather design paper to create a fringe for our basket, but you can leave it plain too. Create adorable moccasins that make a great take-home craft! 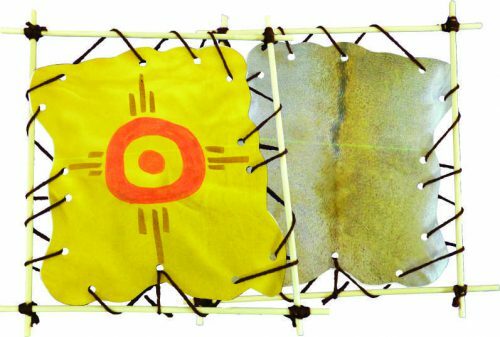 This craft helps immerse students in Native American and First Nations cultural garb. We have included two templates: a larger one for take-home crafts and a smaller one that creates moccasins to fit on dolls! Learning Outcomes: Explore Native American and First Nations cultural heritage. Learn about the ways natural materials were used to make practical and beautiful items. Exercise fine motor skills by cutting and folding. Traditionally, moccasins are made of soft leather (usually deer, although native peoples in Alaska often used seal or caribou leather, depending on the resources available; for more information check out this cool museum! ), and are decorated with beads, porcupine quills or fur. Each culture has their own unique styles and designs for moccasins, but the basic design includes a sole (the bottom of the moccasin) and an upper that is stitched together at the top. Some designs also include a vamp (the middle piece that covers your toes and the top of your foot). Etymologically, the word moccasin derives from the Algonquian language Powhatan word makasin (cognate to Massachusett mohkisson / mokussin, Ojibwa makizin, Mi’kmaq mksɨn), and from the Proto-Algonquian word maxkeseni (shoe). To create your own moccasins, start by downloading the moccasin template, and printing it out on a sheet of craft paper. It may take some experimenting to see which way you need to put the craft paper into the printer so the lines print on the white side. We used the deer hide design for our moccasins, but you can choose your favorite paper! The Miniature Moccasins template needs two sheets of paper to create one pair of moccasins. The Doll Moccasin template needs one sheet of paper to make two pairs of moccasins. Your moccasin crafts can be a final art product in and of themselves, or they can be added to presentations, posters and reports as visual aids. This wearable art is a terrific fashion statement! Learning Outcomes: Learn about the textures and properties of natural materials through manipulation of paper and card board. Exercise fine motor skills. Before metalwork became commonplace, jewelry was made with natural materials like wood, bone, leather and porcupine quills. Bone and wood beads could be strung on leather strips, but porcupine quills have to be softened before they can be used. Additionally, rawhide can be wet down, molded and once dry will keep it’s shape. Finally, wood can be steamed to the point where you can bend it! Our version of this craft doesn’t use real rawhide, but students can experiment with paper-based versions of rawhide wet-molding and wood bending. First cut a 2″ strip of the leather design craft paper and set it aside. You will need it later. To start, mix a solution of 1/2 a cup of white school glue and 1/2 a cup of tap water. Warm water makes mixing easier, but cool or cold water works too. Just make sure you mix the glue in completely, so there are no gluey lumps in the solution. Once your solution is thoroughly mixed, submerge your craft stick in the mixture for up to 90 seconds. To make this process easier, we used the lid of one of Roylco’s beautiful bins! Once the craft stick is soaked, pull it out of the solution and start to gently bend it into a circular shape. Just like traditional bending wood, your craft stick can still break if it dries out or if you bend it too quickly. Carefully place the bent craft stick inside an empty Play-doh® container so the bracelet will keep its shape. Allow to dry for at least two hours. Once the craft stick is dry, remove it from the Play-Doh® container. Lay the 2″ strip of paper in your glue and water solution for a second or two and then gently roll the sheet over the outside of your craft stick. Fold the edges inside so the paper is smooth over top of the craft stick. This technique is similar to wet-molding, and because there is glue in your solution, the paper will be firmly glued to your craft stick once everything dries. Place the paper-covered craft stick back in the Play-Doh® container. Once the bracelet is dry, decorate it with pencil crayon, marker, crayon or paint. Or try cutting out collage shapes from other sheets of craft paper and glue them on to your bracelet. The ultimate fine motor skills craft, kids will cut, lace and tie to create this old-style hide rack! Learning Outcomes: Learn about ancient techniques for drying and stretching animal hides and creating leather. Exercise fine motor skills as students cut, lace and tie this challenging craft. Start by choosing two sheets of craft paper. I chose to use the deer hide and the leather sheets, to show the two possible outcomes of drying animal hides. Use a small loop of tape in the center of the white sides of the sheets to hold them together. This way, both of your hides will be exactly the same shape when you cut them out. Students can be as creative or literal as they want to when they cut the shape of their hides out. Remember that every animal is a slightly different size, so every hide is unique! I kept my shape vaguely rectangular, but you can choose a wild shape if you want to. Once you have your hide shape cut out, use your hole punch to make regularly spaced holes. These will allow you to anchor your hide to the frame. Now it’s time to create your frame. I used four 10″ (25.5 cm) long dowels from the craft store. You can use chopsticks if you want, or students can use small, straight twigs from the playground. Cut four 6″ (15 cm) pieces of yarn. Cross the ends of two of your dowels so that make a right angle. Use a piece of yarn to tie the two together. For a more secure tie, I wrapped my yarn twice in each diagonal, and twice above and below. Trim off any excess yarn. Continue tying the ends of the dowels together until you have a square frame. Once your frame is all put together, it’s time to hang your hide on it. Cut a piece of yarn approximately 30″ (76 cm) long, and thread one end through one of our plastic lacing needles. The flexible eye makes threading a breeze! Tie the other end of the yarn to the center of one of your four dowels. Loosely “sew” your hide to your frame. Remember that your hide is supposed to be suspended in the middle of the frame, so don’t pull your yarn too tight. When you come back to the place you started, tie the free end of the yarn to your frame. Trim off any excess yarn. Now that your hide is stretched, it’s time to decorate! I used washable markers to create a design on the leather side of my hide, and left the deer hide half as it was. Students can use washable markers, crayons or colored pencils to decorate their hides. This is a great take-home craft, but it also is a great addition to a report or presentation. A dynamic and tactile visual aid can help students absorb information and stay focused! This beautiful craft celebrates Native Alaskan culture! Learning Outcomes: Practice fine motor skills while exploring the symbolism behind cultural masks. It is difficult to generalize the styles and usage of masks, especially among the Native Alaskan cultures. Masks can range in size from tiny, 3 inch maskettes, to masks that require several people to carry! Masks can be made of all kinds of materials including bone and driftwood. Sometimes masks are painted bright colors. My mask is inspired by Yup’ik designs, and I started with the wood grain sheet of craft paper. I started by drawing a rough outline of a face. You can choose to use an animal shape instead, or get creative and abstract! Once I cut out the face, i cut out the eyes, nose and mouth. Now it’s time to start decorating your mask! One crucial stylistic element of native Alaskan art to keep in mind is ovoids. Ovoids are a basic shape element that can come in many different scales. However, no matter the scale, ovoids are always rounded rectangles with a convex top (similar to a slice of bread). As you can see in the finished mask image at the top, the shapes drawn around the eyes in red are both ovoids. I suggest using washable markers instead of paint to decorate your mask. Black, red and blue are traditionally used colors. Once your mask is “painted,” it’s time to add the other decorations. I chose to use plastic drinking straws in place of wood. Some masks use wood that has been steamed and gently bent to create beautiful curved effects. Start by flipping your mask over, so the decorated side is down. Cut your drinking straws to your desired length(s). Tape each straw to the back of your mask. Tip each straw with a decoration. I chose to use feathers and claws, as well as chevrons cut from the porcupine quill sheet of paper, but you can get as creative as you want! Simply tape each decoration to the end of the straws.Flip your mask back over to see the full effect!